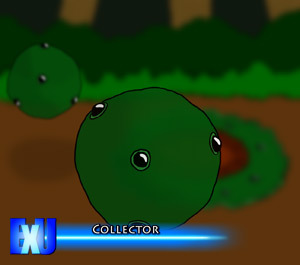 A collector is a best described as a floating slime ball that spawns from a Spawner, it will collect liquid, gas or mineral resources by enveloping them. Once this has been done it will take it back to the Spawner where it will be converted. Collectors can also grow on their own in areas where a Spawner can’t grow with the use of a Seeder. Once it has matured it will start collecting resources. If it can't find a Spawner, it will start consuming the resources by itself and will grow in size. Because of this size increase its speed will slow down, but it will also get thougher at the same time. Nothing like a Searcher, but still much tougher then a normal Collector.